In the South American country of Bolivia, at an elevation of 12,600 feet above sea level is the combined archaeological site of Tiwanaku (possibly derived from the local Aymara Indian word for “The Stone of the Center”)and the nearby site of Puma Punku (“Gate of the Mountain Lion”). Both lie about three miles (depending on the level of the water) from the highest navigable body of water in the world, Lake Titicaca. The ruins here are ancient. When the Spanish arrived in the 1500’s, the sites had all suffered from centuries of erosion, pilfering and vandalism from various groups. Anything that could be ready moved and could be used for buildings, etc., was long ago carried away. The resulting jumble is difficult, at best, to interpret. The Bolivian authorities have tried to partially re-assemble many of the stone structures, but their interpretation is, with all due respect, questionable. If nothing else, so much has been removed that they don't even know what they are missing. The carvings that have been left are all arcane, highly-stylized figures that are eroded and difficult to decipher. 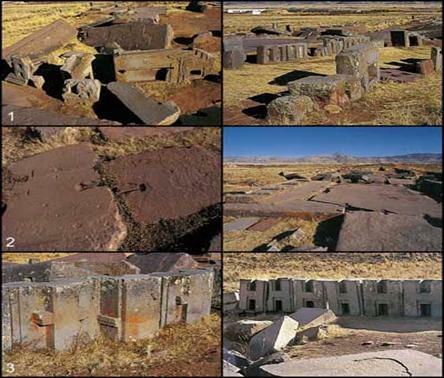 There has been no evidence of writing discovered, so we have no real eyewitness record of who lived here, other than the irrefutable evidence of the structures left behind. Those structures are fascinating enough! 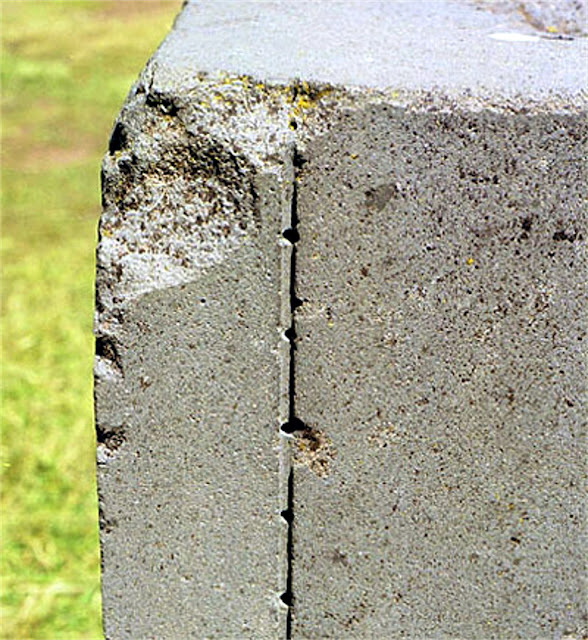 Once again, we have monolithic stones up to 26 feet tall, weighing up to 100 tons, fit together with unbelievable precision, performed over and over again, with mass produced exactitude. 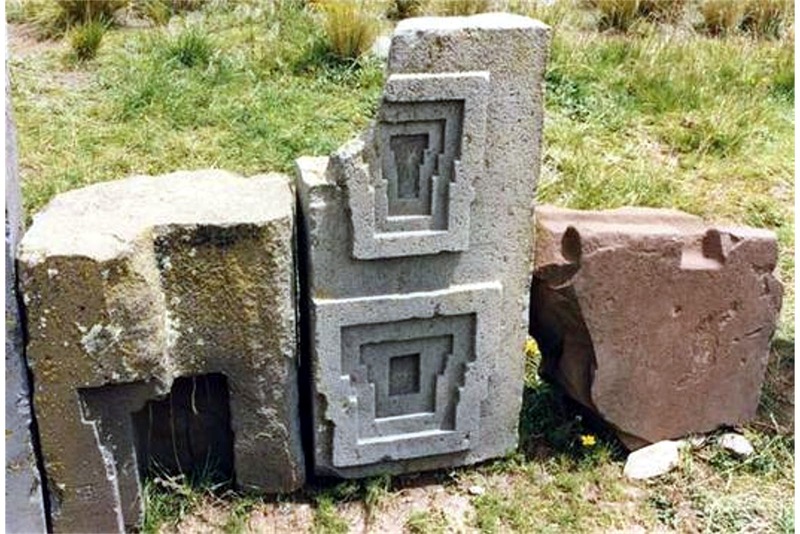 Especially at Puma Punku, we find stones built to interconnect like Lego blocks and formed in ways that we CANNOT duplicate today, without a huge allocation of time and effort, with technology such as computers and lasers. We’ve discussed that enough in previous blog entries, so let’s go on, but I want to note one fact. 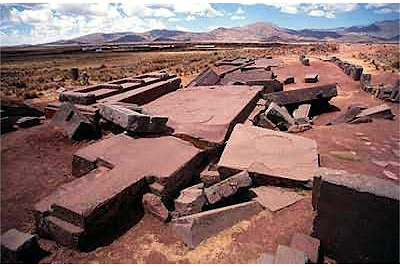 It takes only a quick glance to realize that these hundreds of mega-ton, interlocked stones have been scattered across the plain in the same way that a child would scatter dominoes – or maybe a large influx of water would do this? The theory exists that some form of explosion, like the impact of a meteor, caused this scattering. This is unsupported by any signs of burning or cratering. These huge megaliths have been shattered, ground together, scattered abroad and buried in mud. 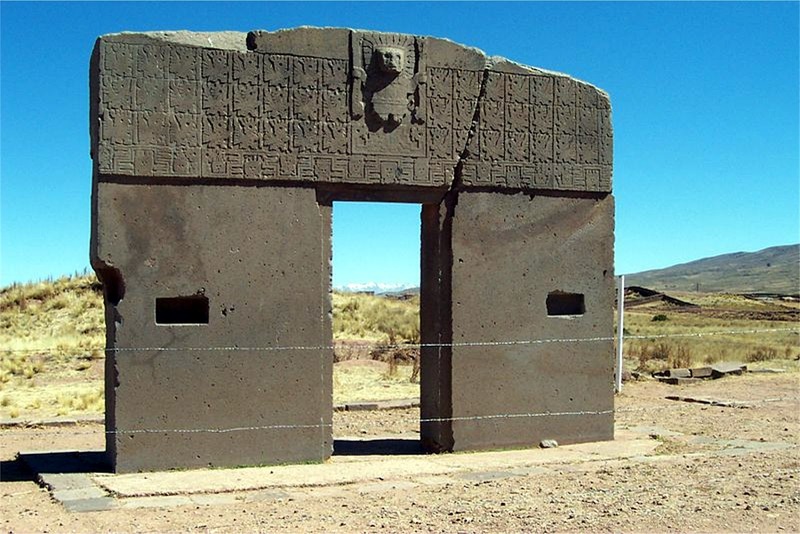 Scientists think that a wall of mud 8 to 10 feet tall inundated Puma Punku. 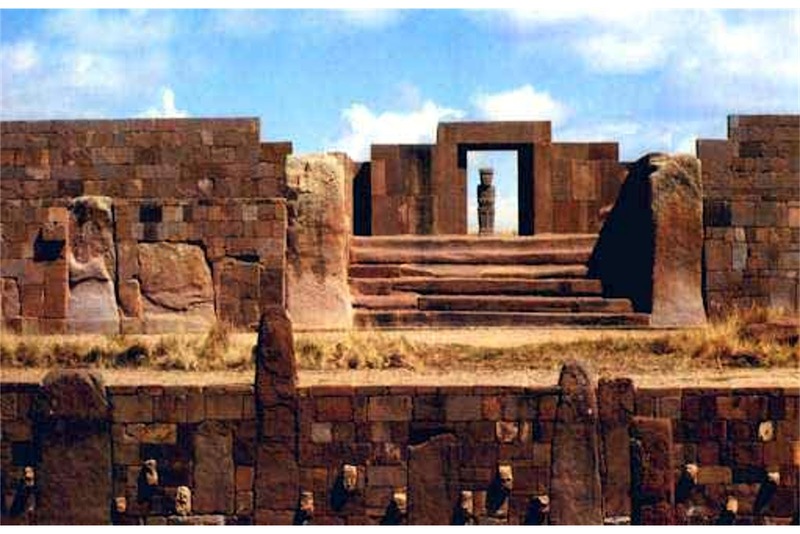 Statue called "The Prior" at Tiwanaku. There has also been found evidence of extensive use of the "flooded-raised field" agriculture (suka kollus) that we have discussed earlier. Also impressive and evidence that a large population was supported here at one time, in a place that is currently barren altiplano, but let’s go on. As you move toward the Lake (which, remember, is about three miles away), a large wharf area, just under the surface of the lake, a wharf or dock was found. The crescent shaped stonework structure has very large and deep docks and piers stretching out from it, like the teeth on a comb. Ships that traveled a lake wouldn’t need such large and deep berths. Only ocean-going ships would use such berths - ships with deep keels. While we’re speaking of the ocean and Lake Titicaca, it is noteworthy that there are species of sea horses living in the Lake. Sea horses are, like their name says, salt water creatures. What are they doing in a fresh water lake? Exploration of the bottom of Lake Titicaca has been very slow for two reasons. First, technically, it is very difficult and quite dangerous to scuba dive in such cold water at such high altitudes. Remember, this is over 2.5 miles above sea level. Only recently have a very few researchers had the skill, the courage and the technology to begin exploration. Secondly, the materialistic uniformitarian academics have completely disregarded the local fishermen’s numerous and emphatically held testimonies about the walls and buildings that they could see underwater when drought lowered the water levels. No great surprise, then, that even these tentative dives have found well-built walls and buildings. 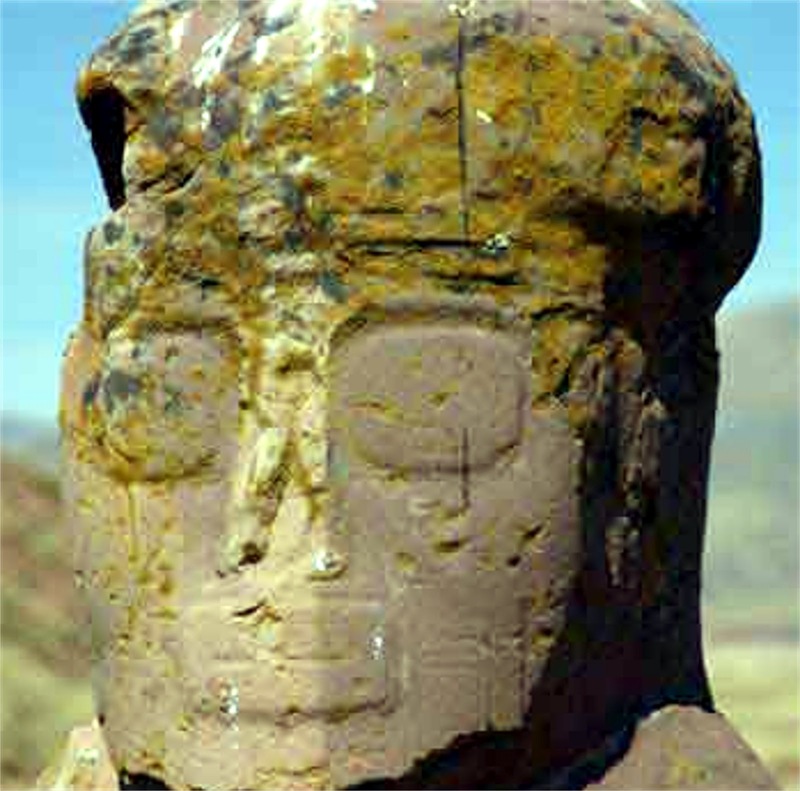 The carvings and statues found are identical to the ones in the nearby Tiwanaku complex. 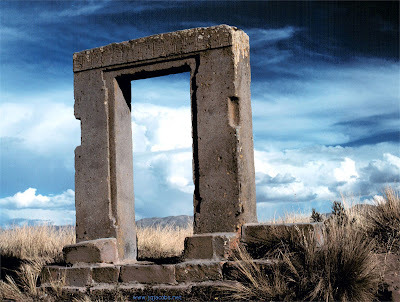 It is interesting, although not necessarily true, that the local Aymara Indians say that the ruins of Tiwanaku and Puma Punku were built long ago, by a “god” (Veracocha, who is described as being tall, bearded, fair-haired and light skinned– totally unlike the local natives). In order to build the buildings, giants were created and put to work on the city. When the giants displeased the “god,” they were destroyed by a flood. Hmmm. 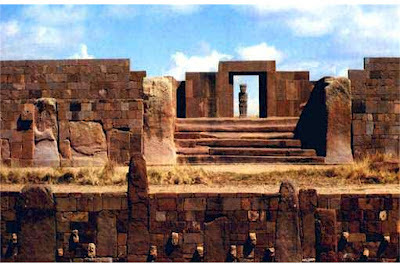 It may be worthy of note here that the ruins at Tiwanaku, though not at Puma Punku, still feature many carvings of faces, both in the walls and on some of the remaining free-standing statues. Many people say that the faces depicted on these images are representative of all the types of people known in the world. 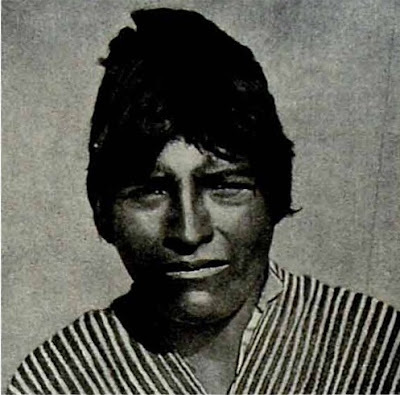 They are certainly widely varied in detail, but the interpretation of their racial characteristic may be open for discussion. The variation in the faces alone is interesting. The local peoples, the Aymara and Quechua Indians, show little variation in their features, as is true with most isolated peoples. You can see this clearly from the photos. What is more clear is the evidence of one statue in particular. 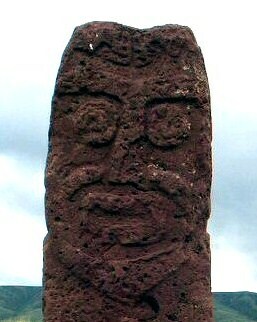 This particular statue distinctly shows a man with bushy eyebrows, thick lips and a full beard. 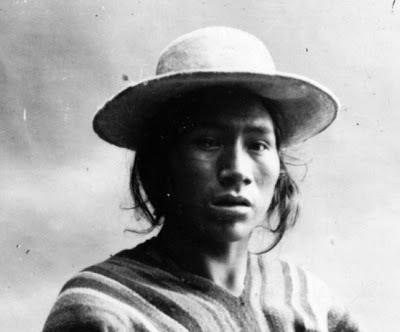 This is drastically different from the local peoples, who have very thin lips, and, (like almost all Native American peoples) very little if any facial hair below the eyebrows. The sculptor had obviously seen an individual who did not belong to any of the extant native people groups anywhere for thousands of miles. 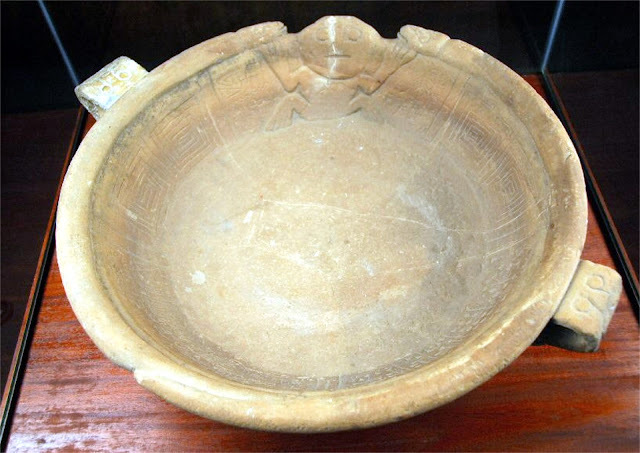 In the 1950's a local farmer found what is called the Fuente Magna bowl buried nearby. It is about two feet across. 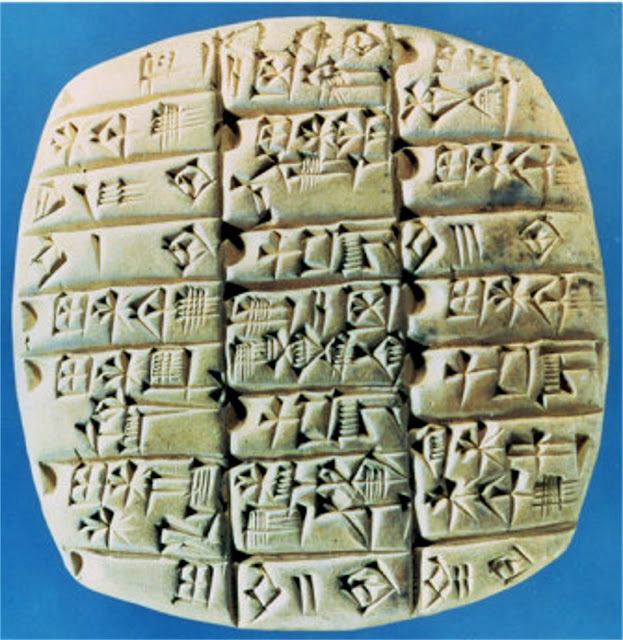 It is heavily inscribed with the earliest forms of Sumerian cuneiform writing. The Sumerians lived 8,000 miles away in Mesopotamia (the place that we call Iraq) and they existed around 3,000 B. C.
This is early Sumerian cuneiform script on the inner rim of the Fuente Magna bowl. 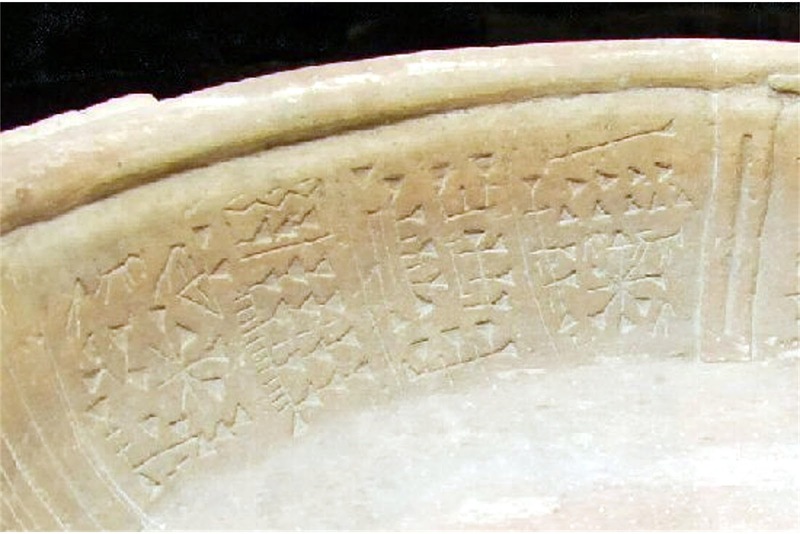 Compare the writing on the Fuente Magna bowl to this example of ancient Sumerian cuneiform writing found in modern Iraq and dated at 3,000 B. C.
Finally, on the mountain sides surrounding the plains area are layers of deposits that are obviously traces of the minerals from a salt sea, filled with fossils of marine life. Most interesting of all is the fact that this layer is diagonal to the current level line – it is tilted. Water doesn’t tilt, not long enough to leave heavy marks on rocks. So, what do all these facts tell us? 1. There was a complex civilization living in this area, with capabilities beyond our current western civilization - in stone working, in construction and in agriculture. 2. Even though the area is currently over two miles in elevation, it was once at, or below, sea level. 3. Not only the altitude, but the level of the terrain has been radically, dramatically, changed. 4. 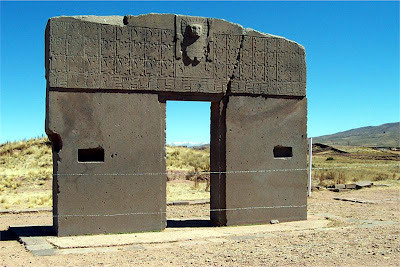 The people currently living in this area do not appear to be the same people who built the stone structures at Tiawanaku and Puma Punku. The builders also appear to have had contact with other civilizations as far away as the Middle East. For those of you who may not remember from the previous blog entries, I favor the theories of Dr. Walter Brown (http://www.creationscience.com/onlinebook/index.html), who holds that the continental plates were moved violently apart at great speed when the underlying layer of saline water was released in the area of the Atlantic Ocean floor that we now call the Atlantic Rift. As the continent (in this case, South America) was pushed away, westward, gliding on the remaining saline layer, the western edge ran off its lubricating layer first, causing that edge to scrape and crash into the underlying stone layers, making it bunch up and wrinkle on that edge. This resulted in mountains like the Andes and the Rockies. 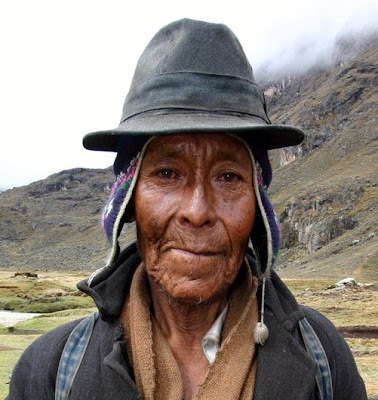 All of this evidence has been preserved in the oxygen poor, arid highlands of Peru for us. If we listen carefully, we can hear echoes of those who came before us. It is my contention that the Bible describes God's original creation of people with extraordinary capabilities who subsequently built an advanced civilization that exceeds our own. That civilization was destroyed in the Great Flood and we have spent the last 5,000 years trying to re-build that civilization and re-gain those capabilities. I contend that science supports all this in multiple disciplines, but this information is ignored or suppressed by various people who have an opposing agenda. You might want to read through the first entry posted on this blog (http://betterthanufos.blogspot.com/2011/02/v-behaviorurldefaultvml-o.html) in order to understand my theoretical and theological underpinnings more clearly.